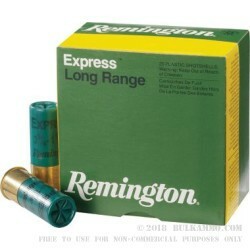 These Remington Express shotshells are a great choice for several applications. The .410 bore 2-1/2 inch cartridges are loaded with #7.5 shot, and are great for bird hunting and shooting clays. Whether you are an experienced marksman looking for a challenge or teaching a young shooter how to use a shotgun, these shotshells will serve admirably for both clay shooting and upland bird hunting. Recently, .410 bore shotguns and revolvers have become a popular choice for self-defense. These shotshells are perfect for self-defense in high population areas, where there is a higher chance of collateral damage. The smaller size of the shot prevents the pellets from travelling through walls and, therefore, bystanders as well. Also, many people choose to use birdshot as a first-round load as a warning shot, a non-lethal deterrent, or as a way to avoid a lethal misfire. Remington is the oldest U.S. firearm and ammunition manufacturer, and they have been making quality products since 1816. Remington’s Express line offers versatility and reliability at even the longest of ranges; their .410 2-1/2 inch #7.5 shotshells are no exception. Pick up a box and see for yourself.